Think of QR (Quick Response) codes as barcodes on steroids. Part of the barcode family, QR codes can handle much more data than the standard barcode, enabling them to handle more complex tasks such as opening a web page, downloading a coupon or contact information, developing an email or text message, or pulling up a video. In part, this is because QR codes are considered two-dimensional, while basic barcodes are one-dimensional. Many modern smartphones can scan QR codes with the download of a free reader app, making them a very useful marketing and promotional tool to attract people on the go. 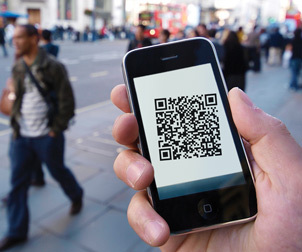 While complex in capabilities, QR codes are simple to open. With a smartphone such as an iPhone, BlackBerry or Droid, simply take a photo of the code with a bar code reader (such as ScanLife.com — easy, free and fast to download), and get automatically directed to a website or other contact point. Even those without smartphones can do it. Simply take/save a JPG of the code, then upload into a program such as the Zxing Decoder Online. QR codes have been around since Toyota subsidiary Denso-Wave created them in 1994. At first, they were used for tracking parts related to vehicle manufacturing. Commonplace in Japan, QR codes are just now taking off in the US. QR codes can supplement label information and add product value, creating innovative marketing and promotional campaigns. For firms of any size seeking marketing innovations, the QR code can be a perfect fit. Place one next to products on a website containing all product details, contact information, and a link to relevant information. Or add one to a business card, so that anyone can scan it into their cell phone. Or, add them to packaging, labels, print ads, flyers, posters, and invitations, — the list is limited only by the imagination. Information can include details about contacts, products, offers, events, and competitions; or contain a coupon, or link to a social media profile. Lightning Labels has printed QR code stickers for The Data Liberation Front, a Google engineering team wanting to make it easier for users to move their data in and out of Google products. Their rationale is that anyone should be able to export any data contained in a product. Anyone with a smartphone camera and barcode scanning application installed could scan the code, to be directed to the Data Liberation Front’s home page on their phone’s mobile browser. When shopping for wine in a liquor store, QR codes can make it possible to read a review about the wine on a smartphone. A Portuguese winery called Cortes de Cima has incorporated a QR code on their wine label. When scanned, the code takes the viewer to a website where people can see reviews and ratings of their wine. Another winery, Tagus Creek, has deployed QR codes on wine labels to direct consumers to website-based videos about wine tastings. QR codes also are enabling purchases on-the-go, maximizing convenience and minimizing the need to give credit cards to strangers. A mobile merchant displays a QR code for a customer on a screen. The customer scans it, in turn opening a private payment window to complete and pay for a transaction without handing over a credit card. Increasingly, airlines are offering QR-code enabled mobile boarding passes. Point, click and voila, you are taken either to a link containing your boarding pass or the pass is emailed to you. Either way, you’ll be able to display it on your mobile browser. In tandem with this advancement, more and more airports are equipping personnel with special mobile-phone scanners that can “collect” the boarding pass directly from the phone. Or, what about event badges containing important contact information that enables people to get acquainted with each other with an easy phone scan? Then, there’s the free gift offer accessible via ad or product QR codes. Scan and win. Also fair game are magazine ads, billboards, and T-shirts — the list goes on and on. Another important element is the search engine factor. When QR codes are added to a website, the search engines see that pages are being changed and updated, helping SEO efforts. Direct mail aficionados also are getting into the QR code business. Direct mail packs increasingly carry the codes, which recipients can scan to see promotions, discounts and the like. To explore and test out simple QR codes, go to a free generation site such as Zxing Project or Kaywa.com. Or, there’s Open Source code available if you have a developer. Once the code is generated, save it as a JPG and post it wherever you want your audience to see it. Lightning Labels now offers an in-house QR code creation service that can complement the QR code marketing campaign you create on your own or with the assistance of a marketing agency. Among criteria to consider when crafting your campaign include: Who your audience is, what you want them to do, how complicated the challenge is (e.g., a simple contact card versus a link to a website video), and what smartphone browser considerations need to be addressed. We’ve all experienced the frustration of pulling up a web image that doesn’t display correctly because it hasn’t been optimized for a particular browser. If QR code enthusiasts are frustrated in their attempts to scan the code because of mobile browser issues, you could lose them permanently. This issue merits being addressed at the phone manufacturer, operating system and application levels. For example, web pages that come up fine on a BlackBerry may prove unsuitable for a Droid phone.